he Travels of Sir John Mandeville Beyond the Holy Land follows a journey that began in 1322 and continued on for more than thirty years. This edition commences as Mandeville leaves the Holy Land and travels east to the lands beyond Egypt, which were mostly unknown to Western Europeans at that time. 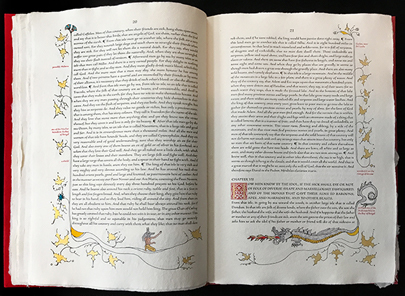 It is a strange journey and one that has kept his book alive and in print since it was first published in manuscript form in 1357. No one really knows who John Mandeville was though he claims to be an English knight. In fact, there is no real proof that he actually traveled at all although scholars believe he did go at least as far as the Holy Land and Egypt. Whether or not he traveled as far as he claimed has little importance today because to historians of literature this “fabrication” of a travel book, this creation of imaginary travels, is a literary achievement of the highest order. His was a piece of European literature rather than a history of exploration. It is a book read by Cervantes, by Rabelais, and Montaigne and was found within the personal library of Leonardo da Vinci. The book was carried aboard ship by Christopher Columbus and others on their voyages of discovery, adding to their confidence that they could safely circumnavigate the globe. Our edition is illustrated and illuminated by Peggy Gotthold following Mandeville’s observations of strange flora and fauna and the remarkable beings he encountered; and especially of the wondrous and powerful kingdoms he chanced upon, which held more gold and jewels and strange customs than his contemporaries could imagine; here are kings and emperors with power at their finger tips beyond the reach of any autocratic ruler in Medieval Europe. Our text is based mainly on the Cotton MS, a translation that was first edited in 1725 and continues to be a starting point for serious study of Sir John Mandeville. Though imperfect, it adheres very closely to the original. 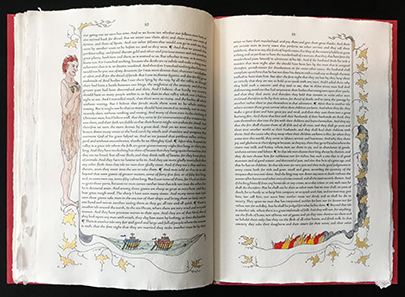 The Travels of Sir John Mandeville was a popular manuscript book written in French, which literate English layman could more easily read that Latin. 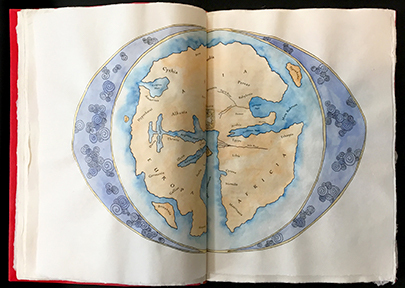 As no inventive travel book should be made without including a map or two, we have supplemented Mandeville’s narrative with five imaginative maps created for this edition. These are maps that would make sense to a fellow traveler of Mandeville’s time. They are not modern maps where one might expect to identify one’s place on land or the sea. There are no precise coordinates of latitude and longitude. These maps are also narrative and allow the reading traveler to follow Sir John Mandeville, whoever he was, through an unfamiliar landscape. The modern reader will also discover the bizarre and unexpected in the world and share in Mandeville’s amazement and curiosity while traveling alongside him. 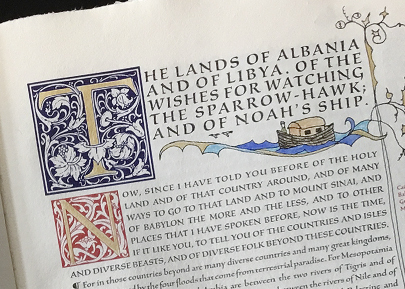 The Travels of Sir John Mandeville Beyond the Holy Land is published in an edition limited to 90 numbered copies signed by the printer and bookbinder. The text, which is Silentium, designed by Jovica Veljović, is printed on handmade Chancery paper. 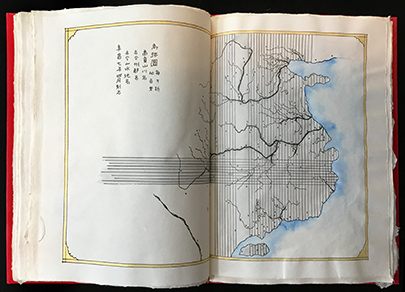 There are five double-spread maps printed on handmade linen paper and then hand colored. All illustrations are by Peggy Gotthold. 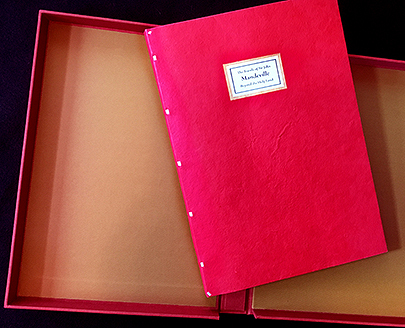 The book is bound in handmade, Cave Paper and comes in a cloth-covered box. The price is $1200. plus appropriate California sales tax. Shipping in the U.S. is $20., foreign shipping is at actual cost. Orders may be placed by telephone, email, or letter. Book dealer and institutional discounts are applied. Special discounts are applied to our Standing Orders. Check with us for availability and scheduled delivery.